If you love yoga and being active, this is the perfect new fitness accessory. This yoga strap will help you stretch in ways you never knew you could! This strap is about 73" x 1.5", being extra long for all heights. It is made of a strong polyester weave to make it extra durable. It has two D-shaped buckles on one end, while the other end is able to slip through these buckles in order to create a loop. Loop the strap around your feet or legs in different way to help you stretch or use your yoga positions more effectively. If your strap gets stained or dirty, throw it in the washer on a more delicate cycle and air dry when done. Find the perfect parts to create the perfect design in our design center. Have fun picking your font, background, graphics, and more! 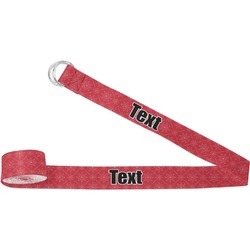 You will customize a 12" section that will repeat on the front and back of your whole strap. If you come up with any questions, don't hesitate to ask! Wanting more sports products? Be sure to check out our sports section where you'll find personalized yoga mats, aluminum water bottles, stadium cushions, golf towels, and so much more! Don't miss it!